The Tennessean reported: A Nashville-based company that manages dental care centers in 22 states has filed for bankruptcy to restructure its debt and eventually attempt to sell its operations and assets. 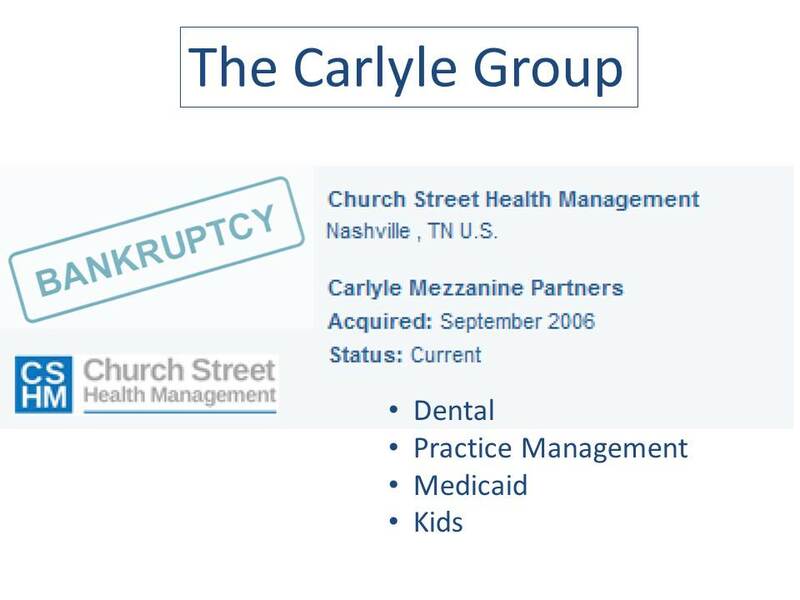 Church Street Health Management LLC’s filing with the Middle Tennessee U.S. Bankruptcy Court this week listed roughly $85 million of assets and $300 million of liabilities. How much goodwill did it take to get Church Street's sheet to balance? Owners not only stretched the value of the company, they took liberties with kid's teeth and billing Uncle Sam. That debt includes $150 million owed to its lenders and $17 million owed to several states and the U.S. Department of Justice under a settlement of charges that it billed Medicaid for unnecessary dental procedures for low-income children. (9) causing claims to be submitted by the Centers for reimbursement for behavior management techniques, including without limitation those techniques involving a papoose board, that were not medically necessary and/or were performed in a manner that did not meet professionally-recognized standards of care. The above behavior resulted in a $24 million (plus interest) fine. It seems Carlyle and Church Street are morally bankrupt as well as literally. Did Church Street pay dividends or special distributions since The Carlyle Group invested in the company in September 2006? If so, did PEU owners load Church Street with debt to fund payouts? Medicaid considers management fees and capital cost reimbursable items on the acute side of health care. Does it do the same for dental? How much did Carlyle, American Capital Strategies and Arcapita pull out of Church Street before it imploded? Did any buy credit default swaps on Church's debt? That could help ease the ache, but it would continue the morally bankrupt theme. Private equity purports to be the savior of America's lopsided health care system. Greed won't help, not in the least. Arcapita(f/d/b/a First Islamic Bank), another principal part of the terrorizing company, also filed bankruptcy. Below are Statements and Reports of Church Street Health Management – Small Smiles filed with the Bankruptcy Court. You don’t want to miss these.